Team players. Natural leaders. Credit sharers. Gracious competitors. 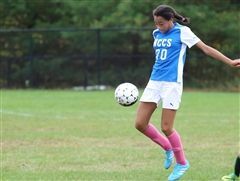 The lifelong enjoyment of physical activity and a healthy attitude toward athletic competition are the primary goals of the physical education and sports program at NCCS. This is achieved through an age-appropriate, creative and challenging athletics curriculum in Grades K through 9. From an emphasis on participation, fitness, skills and sportsmanship in the youngest grades to continuing participation and ability-based teams in the upper school, our enthusiastic athletes are well prepared for high school athletics. Kindergarten through Grade 2 students participate by homeroom. Students in Grades 3 and 4 move to a gender-based program, where we introduce specific sport units that our students will be exposed to in the Middle and Upper Schools. In the Middle School, students transition to a combination of intramural and interscholastic programs. In the fall and spring seasons, students select a sport and play a competitive interscholastic schedule. Each team competes with peer schools from the Fairchester Middle School Athletic League (FAA). Playing time is evenly distributed, and the emphasis is on sport-specific skills, collaborative team work, sportsmanship, team pride and improvement over the course of a season. Usually there is more than one team in a given sport. In these cases, teams are created to be equal, both by grade level and skill level. Frequently, two separate teams in a given sport will practice together daily, which helps promote a sense of community and strengthens the bonds between students. The winter season is intramural-based and is divided into two equal sessions. Students rank preferences from a variety of offerings and have the opportunity to experience two sports. This intramural season adds to the students’ total athletic experience, while also providing a chance for sport-specific skill development and camaraderie amongst peers. In the Upper School, students are placed on ability-based teams through a tryout period each preseason. Every student has a chance to participate at a level that complements his or her skill level, so that each can experience success and growth as an athlete. Our teams compete in the Fairchester Athletic League (FAA), and often against non-league opponents as well. 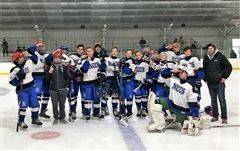 Our Varsity teams are extremely competitive and successful, frequently competing against high school freshman and JV teams, as well as travel teams. Upon graduating from NCCS, our athletes move on to their next schools feeling prepared and confident for the next level of competition. Our extensive indoor and outdoor facilities, including two full gymnasiums, an expansive gross-motor room, a cardiovascular fitness room, outdoor hockey rink, outdoor swimming pool, wooded trails and ropes course, and plentiful field space suit our program well. We also have a full-time school nurse and an athletic trainer to educate our athletes and help keep them and visiting teams safe and cared for. New Canaan Country School Varsity Boys’ Lacrosse outscored four opponents with a total of 34-5 goals, winning the 2018 Greenwich Country Day School Lacrosse Invitational held in Greenwich, May 5. “During my 12 years at Country School, I have participated in and played many different sports. However, of all of them, squash has been the most challenging,” said James Kontulis in remarks delivered at the school’s end-of-term sports assembly, Feb. 26. James, a ninth grader, was one of two student-athletes selected to speak at the event. 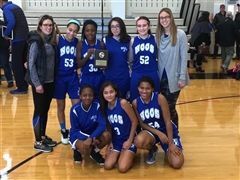 The New Canaan Country School girls’ basketball team earned second place honors at an invitational tournament held Jan. 20 at Greenwich Country Day School. The seventh, eighth and ninth grade NCCS girls played a total of five games, winning four. 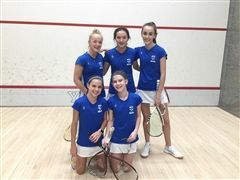 The New Canaan Country School girls' squash team earned a fourth place national ranking following three days of hard-fought matches in the 2018 U.S. Middle School Team Squash Championship held at Yale University Jan. 19-21. Seeded in Division I, the seventh and eighth grade girls played a total of four matches, winning two. Girls’ Varsity Hockey had a strong start to their season with two decisive wins; a 4-2 victory over Upland Country Day School and an 8-3 win against Choate. New Canaan Country School congratulates alumna Annie Leonard ’11 (Darien, CT), a member of Middlebury College’s field hockey team, for clinching the NCAA Championship on Nov. 19. The 4-0 win over top-ranked Messiah (22-1) is the second championship Middlebury has secured in three years. The second-ranked Panthers finish their season tying the school-record with 20 wins (20-2), and an NESCAC Championship. Two Upper School teams celebrated undefeated seasons this fall. Girls’ Field Hockey recorded a final tally of 9-0-1 against perennial powerhouse teams including Greenwich Academy and Sacred Heart of Greenwich. 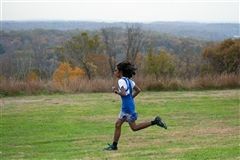 As luck would have it, Jack Johnson chose to try Cross Country in the 5th grade. “Really, it was a process of elimination. 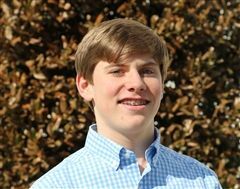 We were required to choose a competitive sport in Middle School,” explained Jack, now a ninth grader, during remarks he made at the Upper School Fall Sports Assembly on Nov. 13. “Football didn’t appeal, and I hadn’t played soccer since first grade when my parents said I spent most of the game talking to myself about the shapes of the clouds. I didn’t really consider myself an ‘athlete’.” That’s all changed now. New Canaan Country School Boys’ Varsity Lacrosse scored an undefeated season with a 7-0 final record. The team, consisting of Upper School students (grades 7, 8 and 9), competed in the Fairchester Athletic League, made up of independent schools from Fairfield and Westchester Counties. The Country School Cougars netted 103 goals scored versus just 27 allowed, showing their strength at both ends of the field. The Tewaaraton Award is recognized as the pre-eminent lacrosse award, honoring the top male and female college lacrosse player in the United States, and Princeton senior midfielder Olivia Hompe ’10 is on the short list of nominees for this prestigious student-athlete award. Five members of the New Canaan Country School class of 2013 attribute their roles as captains of their high school football teams to the leadership skills they learned at New Canaan Country School. John Fox, Rory Tait, Emerson Logie, Jackson Quinn and Charlie Erdmann—all still close friends—have learned important life lessons both on and off the field, and continue to bring those lessons forward at their respective schools. Keri Kern has worked as Director of Athletics since 2007. Prior to Country School, she was the Assistant Director of Admission and Athletics at Groton School in Groton, Mass., where she also served as Co-Head of Special Interest Recruitment, Head Coach of the Varsity field hockey and lacrosse teams and dorm affiliate. Keri earned her B.A. in Psychology and a Minor in Marketing and Management at Duke University, where she also competed for the nationally-ranked field hockey and lacrosse teams. During the course of her college career, she participated in five NCAA Division I Tournaments, including the NCAA Division I Women’ Lacrosse Final Four. 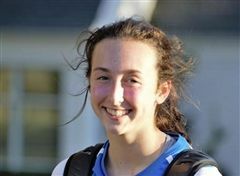 She is a product of independent schools, having graduated from Thayer Academy in Braintree, Mass., where she picked up First Team All-American accolades in both field hockey and lacrosse. She has also coached at various camps at both the college and high school level, as well as the MassElite and Granite State Elite club teams. She enjoys skiing, jogging and visiting Cape Cod in summer. She and her husband, Greg, have two children, Taylor ’27 and Topher ’26. Stefan Borowski has been working as the Assistant Athletic Director since 2014. Before this, he was part of our Apprentice Teacher Program working in 3rd and 5th grade, while also coaching in our Upper School. Stefan earned his B.A. in Educational Studies – Elementary Concentration from Denison University, where he was also a member of Men’s Soccer team. A native of Maryland, Stefan has been a part of a number of top level soccer teams, including Bethesda-Olney Soccer Club and Maryland ODP. He still enjoys playing soccer today, running, competing in obstacle course races and spending his summers in the beautiful state of Maine at a summer camp. Chantal Angelis has been working as the Physical Education Coordinator for the past three years, and prior to that was at the Stanwich School in Greenwich for eight years working as a Physical Education Teacher/Coach and Athletic Director. Chantal attended Lehigh University on a full athletic scholarship for basketball, where she earned her B.A. in Psychology and her Master’s Degree in Education. She departed Lehigh as one of the Top 10 all-time assist leaders in school history. Prior to her college days, Chantal was a three sport standout in high school, earning First Team All-State honors in soccer, basketball and tennis. She was the all-time leading goal scorer in soccer for her high school team, scoring 76 goals in four Varsity seasons and was a member of two state championships tennis teams at the second doubles and second singles position. Chantal is passionate about teaching the sport of basketball to the next generation, creating a Second and Third Grade all girls dribbling team called the Dribblers who perform various times throughout the winter. She enjoys being outside and being active. While not chasing after her 19 month old son Miles, she enjoys competing in triathlons, running races, and playing tennis with her husband Kevin. Charles Khuen grew up playing soccer and lacrosse in Winchester, MA while attending and playing at The Fenn School in Concord, MA. He attended Winchester High School where he was a starter and captain of the varsity lacrosse and soccer teams. He holds the most career goals and career points records for Winchester High School boy’s lacrosse. After graduation, Charles moved to San Diego where he played soccer for San Diego City College and was captain. He led the team to a Pacific Coast Conference championship and a deep run into the state playoffs. Charles also coached in the Poway youth lacrosse system while living in San Diego. He transferred to University of California, Davis where he double-majored in Middle East/South Asian Studies and Religious Studies with a minor in World History. He played lacrosse at UC Davis his senior year after recovering from ACL surgery. After graduation, Charles went to Israel for six months on an extended study course focusing on the Israeli-Palestinian conflict. From Israel, Charles traveled to Amman, Jordan where he helped establish the first all-female soccer league. The league was exclusively for Iraqi and Palestinian refugee children and young women. He was in Jordan for eight months, spending the first three months training female coaches and the next five running the league among different neighborhoods in Amman. Charles returned to Boston and began coaching for Grasshopper Football Club and working at Fenn as a soccer/lacrosse coach and assistant teacher. He has been at New Canaan Country School for seven years, leading three lacrosse teams to undefeated seasons and acting as the boy’s varsity soccer and lacrosse coach. Matthew McDonald is in his second year as a Mathematics teacher in the Upper School at Country School after spending one year as an apprentice in the 5th grade. He is in his third year as the Varsity boys hockey coach and coaches soccer and lacrosse in the Upper School as well. Matt earned a B.A. in Mathematics and Psychology from Hamilton College and an M.A.T in Secondary Mathematics from Manhattanville College. While at Hamilton, Matt played on the Varsity hockey team and helped coach a local U-12 hockey team, the Clinton Comets. A native of upstate New York, Matt earned all-league honors while playing hockey and soccer at Potsdam Central High School and played on the lacrosse team as a freshman. After his junior year, Matt transferred to Deerfield Academy where he spent two seasons as a member of the Varsity soccer and hockey teams. In his free time, Matt is also a coach at the New Canaan Winter Club, acting as the assistant coach for the Bantam As and the head coach for the U-18 team. Will McDonough has taught English and social studies in the Upper School and coached cross country since 2008. Prior to Country School, he worked at Wasatch Academy, a boarding school in Mount Pleasant, UT, where he served as a dorm parent, history teacher, and assistant track coach. He earned his B.A. in History with a Minor in Education at Middlebury College, where he also competed for the cross country and track teams. During the course of his college career, Will earned 11 varsity letters (in cross country, indoor, outdoor track), achieved four school records, and was named to All-Vermont (cross country), All-NESCAC (3000m steeplechase) and All-DIII New England (Distance Medley Relay, 3000m steeplechase, 1500m) teams. Will also served as captain of both the cross country and track teams during his senior year, earning Middlebury's Erkki "Stubb" Mackey Award for Leadership. Will earned his M.Ed from University of Illinois in Global Studies in Educational Policy, Organization, and Leadership. Will is a product of independent schools, having graduated from New Hampton School (New Hampton, NH), where he ran cross country and played basketball, lacrosse, and soccer. 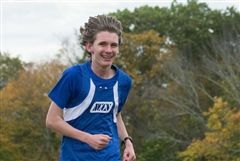 He was Lakes Region XC Champion and All-NEPSAC over the course of his running career. Will still runs many competitive local races in distances ranging from 1 mile through the marathon. He roots for the Celtics and Red Sox and loves being outside and exploring with his family: wife Nicole, Naomi ('26), Jonah, and Gideon. Sean Robb has taught Lower School Spanish for the last six years, and prior to that he taught Spanish from pre-K through 8th grade at Whitby School in Greenwich for five years. At Country School, he has been the head coach for the Varsity Girls Soccer team since his arrival in 2011, and coaches Cross Country during the spring season. He is finishing up his Master’s Degree in Secondary Education – Spanish at Fairfield University. Before that he earned a BA in American Studies with a minor in Spanish at Skidmore College, where he also studied for a semester at Universidad de Alicante in Spain. At Skidmore, he was a four-year starter for the Men’s Soccer team and was elected captain in his senior year. In his younger days, he helped his Choate Rosemary Hall soccer team reach the New England Championship final and also was a product of VT ODP, as well as a top singles player in tennis. Since his college days, he has coached a variety of levels and teams, from school teams to Greenwich Soccer Association teams to soccer camps throughout Vermont, Massachusetts and Connecticut. He continues to play soccer today, and he also enjoys long-distance running, especially while pushing his two children, Luna and Sam, in a double stroller around the hills of Easton. In the summer of 2016, he and his three-year-old daughter completed the Fairfield Half Marathon together. Steve Willson worked as Co-Athletic Director, PE teacher and a three season Varsity coach at Rippowam Cisqua School for 6 years before joining New Canaan Country School, where he continues to work in PE, as well as coach in the Middle and Upper Schools. Steve earned his B.A. in Marketing at Manhattan College and then earned his Master’s degree from Manhattanville College in Sports Pedagogy/Physical Education. While studying at Manhattanville he was also one of the Assistant coaches for the Girls’ basketball team. Prior to working as a teacher and a coach, Steve also worked for ESPN for three years setting up events for the NY Jets, Giants, Ranger and Yankee players while also selling advertising space on TV and Radio. His basketball playing days consisted of being captain at his High School and played AAU around the northeast for three years with a short stint in College. Steve has coached competitive basketball for seven years at the Brewster Sports center in the Super league, and has done summer camps the past six years. Steve’s wife Emily owns and operates a bed and breakfast in Orange County, NY. They also have a two-year-old daughter named Reese, and twins due in May.